Want to receive the latest interviews in your Inbox? Ram Menon co-Founded Avaamo along with Sriram Chakravarthy in early 2014. In his 15 year stint at TIBCO, he was part of a team that transformed a startup into large billion dollar public company. He sold software to the largest companies in the world and managed relationships with 80% of F1000 in 50 countries. When he started Avaamo, his Co-Founder was TIBCO’s VP of Engineering and he was able to bring many of his old TIBCO team along with him to Avaamo. He feels an expereinced team is important in understanding the needs of large enterprises and developing software to cater to their needs. Ram recollects the genesis of how he came up with the idea for Avaamo. During the summer of 2013; his sales team was trying to do a deal with an executive with a large company in Europe. There was a Red Flag in the sales cycle because the client went on a vacation in the last week of the quarter. The entire sales transaction and negotiation happened on WhatsApp because the client was on vacation and did not have email access. In some sense the deal was transacted on an open public network like whats app , entirely on mobile with company specific information transmitted on an insecure network. Ram realized that there is a better way to do this. He realized that there is a huge market for simple secure Business Communication on mobile and there were no credible business tools that was available to fulfil this requirement with adequate cover on Security and Compliance. Avaamo was born. 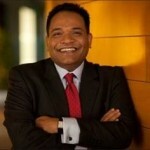 Ram shares some practical insights in selling enterprise software to early customers. A Founder needs to be tell the story on how their product is different. Customers are not interested in hearing about how innovative your product is and and how great you are. They are looking at two things – Will it save them money or make them money?. Every Product needs to cater to one of these requirements. Sound and behave like you are successful even before you have succeeded. From your website to your interaction with the customer. Every customers wants to work with what they perceive is a successful company not with a struggling startup that may go under anyday. The chapter 1 of startup sales is to talk to everybody because a founder is always learning. Avaamo had a team with collective experience of over 300 man years of developing enterprise software at Intel, Apple, SAP, Marketo and TIBCO. They still interacted with around 76 of their past contacts in 11 countries – before the team wrote a single line of code to validate the entire product idea. From a sales perspective, have a short pitch. Open the door with two well-placed sentences to draw the prospect to listen to the 30 minute pitch. Ram says that successful Founders constantly need make tradeoffs on what to leave out of the product. Founders should always make the first sales themselves irrespective of experience. You are learning not selling. Startup sales means Listen first to the pain points and then sell into the pain points. Prove yourself first- Show value first and then discuss price. Price should be last. Spend as little money as you can in all aspects. The capital you raised is your only insurance against failure. Founders should always raise more money than they need but should spend less money than they have. Avaamo raised USD 6.3 million in Seed Funding from WI Harper Group, Rembrandt Venture Partners, Streamlined Ventures, Eleven Two Capital, and Ovo Fund. Avaamo has been piloting the product with 27 organizations in 17 countries. They have been in the Cover of AppsWorld and their first business messaging app has been developed for Apple Watch. They got the first customer in 22 days after they went live and booked their first revenue on the 45th day after being Generally available.